Most homeowners underestimate the prevalence and destructiveness of water damage. Around 37 percent homeowners in the US have suffered from water damage and it is the second most frequently filed insurance claims. Early water detection is extremely crucial for preventing the damages. A water leak detector is extremely helpful for preventing water damage from your precious homes. Sungwoo LED is a battery operated, two pack, water alarm detector. The detector can emit 90dB siren alarm once it detects water leakage. Besides producing siren, it gives warning by lighting up red alarm light. This dual warning is helpful for alerting you realize water is leaking in time. Silicone seal is used for making the battery component and inner part. Therefore, the battery is properly protected from splash or rain even when the whole device immerses in water. You can also install and replace the battery very easily. SABRE Wired is a user-friendly water leak flood alarm sensor with provides maximum coverage. The 110dB alarm is helpful for waking or alerting you during the time of the leak. Flashing red light offers easier visibility. It can also detect water with an all-directional sensor. This is an ideal device for protecting your home, office, apartment, and belongings from water damage. The slim and modern design is really attractive. SABRE Wired is extremely reliable and convenient to use. First Alert WA100-3 is a three pack water leak detector that protects your home from seepage, floods, and leaks. You can use this device in your garages, basements, hot tubs, bathrooms, laundry rooms, etc. First Alert WA100-3 can also be placed near the washing machine, sump pump, toilets, sinks, water heater, etc. You can attach the water sensor to the bottom of the unit or extend 6 feet to a remote location. The alarm sound of this device is loud up to 85dB. If you want to get a smart wireless water sensor, DCH-S160 mydlink is the best option. It can protect your home from flood and leak in the best possible way. You can also detect water damage with the help of this device before it becomes very serious. DCH-S160 mydlink alerts you when the water is detected in the sinks, basements, near a water heater, in a bathroom, dishwashers, or anywhere there might be moisture. The device allows you to increase the alarm volume and range. DCH-S160 mydlink is the best device for understanding the things happening in your home from anywhere. 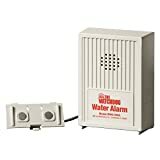 GE Choice Alert Leak Sensor is a wireless alarm system that is highly effective in detecting leaks or possible flooding. Therefore, you can avoid costly water damage. You can use this sensor for monitoring areas of your home that are in high risk of water leaks, such as air conditioners, plumbing lines, hot water tanks, dishwashers, washing machines, etc. A single lithium battery is required for running this compact sensor. 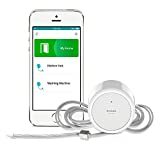 GE Choice Alert Wireless Leak Sensor is cost effective and easy to install. It provides home and away settings, multi-zone coverage, wireless operation, all weather function, etc. General Tools MMD7NP is a non-marring, non-invasive moisture meter that is ideal for detecting moisture under finished surfaces. Auto power off function, HOLD button, low battery indication, and out-of-range alarm are the major features of this device. This is an auto-calibrating wood working tool and it operates on 9V battery. General Tools MMD7NP has a 2-inch backlit LCD screen and three color LED bar graph. It has separate settings for masonry, drywall, hardwoods, and softwoods. Airthings Corentium is an extremely accurate water leak detector. 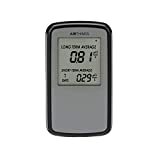 Though simple, it is a very powerful radon gas detector. This state-of-the-art measuring instrument combines performance and ease of use. Airthings Corentium has an LCD screen, which displays average daily, weekly and long term concentrations. Three standard AAA batteries are required for operating this device. You can use it in your home, a day care center, school, office, or any other location. BWD-HWA Basement Watchdog is an ideal device for minimizing the risk of water damage. You can install this early warning system in sump pits or near areas such as air conditioners, hot water heaters, under sinks, washing machines, etc. Constant monitoring is required around these areas. BWD-HWA Basement Watchdog requires only a 9-volt battery to operate. The solid state circuitry of this device is extremely reliable and sensitive. BWD-HWA Basement Watchdog can detect water only 1/32 inch deep. The sensor comes with a 6-foot wire, you can extend it into a sum pit. It can emit 110 dB alarm, which will hear throughout the house. You can prevent water damage on time if you are able to find out when and where water is entering in your home. You can do it very easily if you install Zircon Leak Alert Plus in your home. You will get a year around protection, peace of mind, and can save thousands of dollars if you purchase this device. This device has n automatic sensor, which emits a piercing, loud alarm. This sound is similar to the alarm of smoke detectors. You can simply place this device on the floor of a basement, inside of a sump pump pit, near a washing machine, or wherever you suspect water entry. Zircon 68320 is the best and No 1 water leak detector in this list because it comes with loads of useful features. It comes with two leak alert units without batteries. You can use it near sinks, water heaters, sump pumps, dishwashers, and more. You can place this leak alert for protecting your home from water damage. Thus, if you suspect any potential leaks or flooding, Zircon 68320 will be extremely helpful. It has a loud alarm sound (85dB) with direct contact. You can install this device very easily because it does not require any wiring or hub. During the time of flood, the leak alert will float and make a loud audible sound. Low battery warning provides optimum performance. Water detection systems are used for protecting your home and commercial premises from water damage. As you are aware, hundreds of various different models are available in the market. 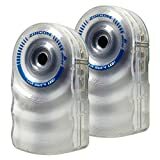 They help you prevent leaks or flooding. The above-mentioned water leak detectors are collected on the basis of various parameters such as cost effectiveness, performance, quality, price, etc. 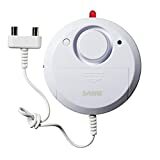 You can select one from this Top 10 Water Leak Detector Reviews In 2019 on the basis of your requirements.